The Aldmor Alignment reminds me a lot of a show I watched on the History Channel, Engineering an Empire, which follows how various Civilizations used Engineering to help win battles. The Aldmor have a great number of Artifacts (Engineering) which help to create various bonuses to benefit the tribe. 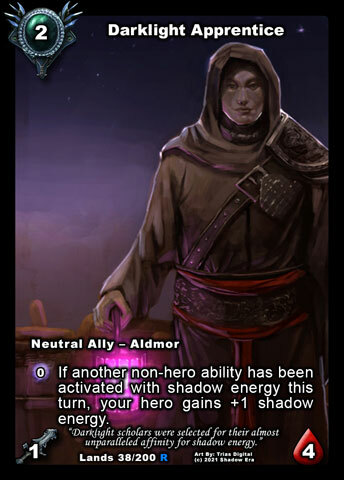 In addition, the Aldmor are also very Shadow Energy based and benefit greatly from SE activated abilities and/or having equal to/more than your opponents. Notes: Child of Aldmor is an interesting ally. Generally his use is going to mostly be to gain SE on summoning to speed up some other use of Shadow Energy. Child has a very weak body and so really does not demand opponents immediate attention. In order to do any real damage or board assistance you will need to rely on the bonuses from other sources. Child is able to recycle back into the deck via his activation ability allowing him to eventually be played again being used as SE farm source. The recycle is immediate so you will not be able to attack or combo the body as a target source for other cards (ex. Road Less Traveled). Notes: Aldmor Interceptor has a standard survivors body with 4 HP. While interceptor also has the potential to have 1 attack and an ability it is completely conditional upon having more Shadow Energy that your opponents. Generally, early in the game, this is going to happen going second, creating a pretty good option to counter human rush leading with Kris and helping to establish a surviving type ally. Where this becomes tricky is that, if you also use his activation ability to counter his turn 2 ally, you will lose the haste and attack so you will need to be smart in what you would like to do. This is an interesting exchange between control and aggressiveness and can become potentially hard to keep up with depending on the SE ramps and outlets your deck may contain. Notes: With an alignment revolving around Shadow Energy, Darklight Apprentice is such a key ally. Apprentice is able to farm Shadow Energy to use with other the various forms of SE outlets. Darklight Apprentice is a very splashable ally in non-Aldmor builds, however you would most likely only see him in builds that contain various forms of SE outlets. Darklight will combo very well with haste sources for its potential to accelerate SE. Since Darklight is a SE ramp source it puts a target on his back creating a “protector” type ally. The inclusion of Meek in the passive ability creates a drawback for non-Aldmor decks. 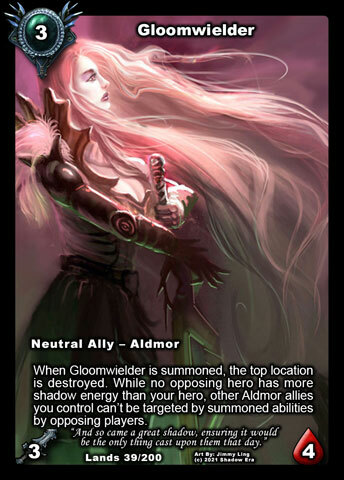 Notes: Gloomwielder is the aggressive ally of the lower costing Aldmor allies with her 3/4 body. Gloomwielder’s passive ability acts like a partial protector (targeting abilities only) and is conditional by only working if you have equal to or more SE than all opposing allies. I find the condition generally hard to achieve and you really need to play with SE generators such as Darklight Apprentice, Aldmor Accelerator, Shadow Font, or Shadow Energy reducers such as Priest of the Light or Radiant Sunlight. Honestly I am not a big fan of Gloomwielder as you can gain much more benefits (guaranteed and easier to trigger) from the other Aldmor allies. Also Gloomwielder is not even a splashable ally as she can only protect other Aldmor allies. 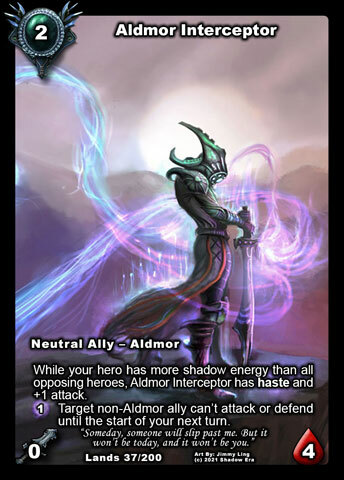 Notes: Aldmor Artisan is an excellent ally for the Aldmor alignment. He has great survival base stats as well as excellent passive and active abilities. If you happen to be playing with the Aldmor artifacts you are most likely going to be using this guy as he is able to help seek the artifacts you need to possibly get them in play when you need them. 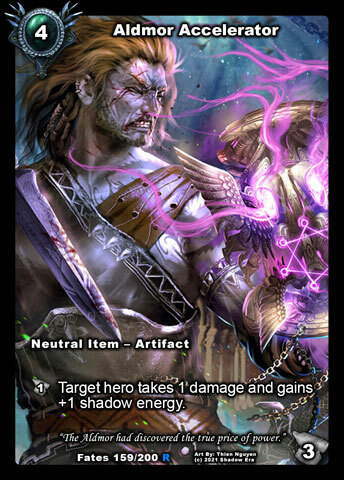 What is also cool is his ability to reduce their cost, being able to summon both Artisan and a 4cc Artifact on turn 5 provided you already had them in your hand. Aldmor Artisan is also not unique so his passive ability can stack further reducing the cost of your 4+cc artifacts. Notes: Aldmor Scout is a very strong ally. 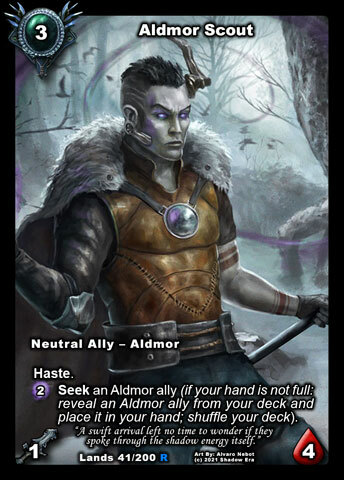 Coming on the board as early as turn 3 with haste and the ability to seek other Aldmor allies (including other Scouts) for a SE cost. Looping Scouts with Rejuvenation Pod and you can have an endless haste army (provided you have the SE). Since the seek is based on SE you can still use your remaining resources to potential play additional cards. Scout is also able to seek your other Aldmor allies that can help you in the various scenarios. Chieftan able to boost attack, Artisan to reduce cost of Artifacts, etc. 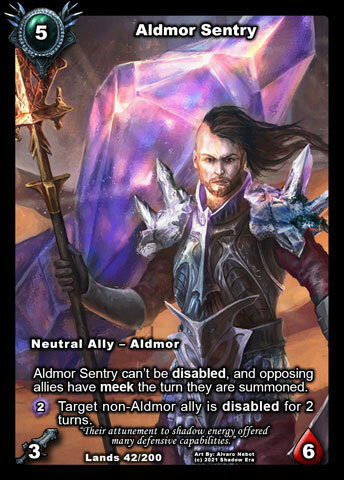 Notes: Aldmor Sentry is a pretty cool ally with a great passive ability as well as activation ability. 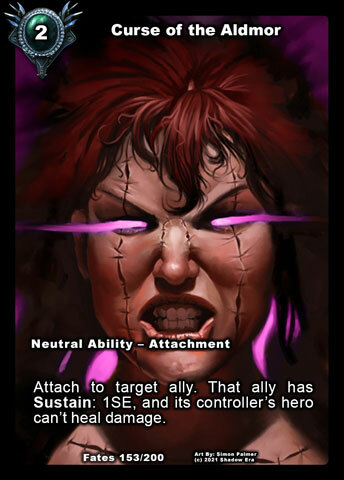 The passive ability grants opposing allies Meek which basically is a Hero protector on the turn the ally is summoned. Mostly this would used against haste decks, which would put the haste damage onto the board vs on the hero. Meek also means that unless there is a better target for opposing allies Sentry most likely will be the target and with low health not likely to survive the first hit since haste decks generally also use attack enhancers. Can’t be disabled is also an interesting as it an ally option to deal with the various sources of disable, and works, flavor wise, with his active ability to be able to disable targets which opens up the possible existence of future disable decks. I think Aldmor Sentry is a good ally but I think a base stat adjustment to 1/5 would probably work better for him. 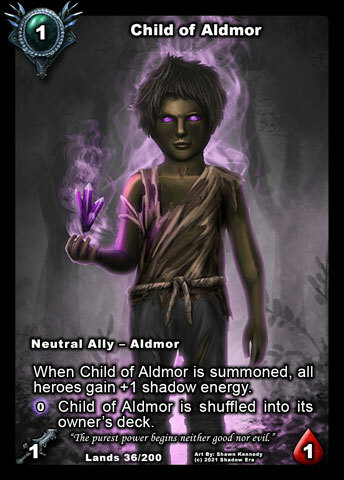 Notes: Disciple of Aldmor is the first and only existing Shadow Ally. Unlike the human counterpart (Ascetic of Aldmor), I find Disciple of Aldmor to be an extremely useful ally. Disciple if immune to all SE abilities which include those found on Heroes (most useful), Items, Allies, Support Abilities and Locations. Disciple is also immune to friendly SE use as well so so pay attention when using. 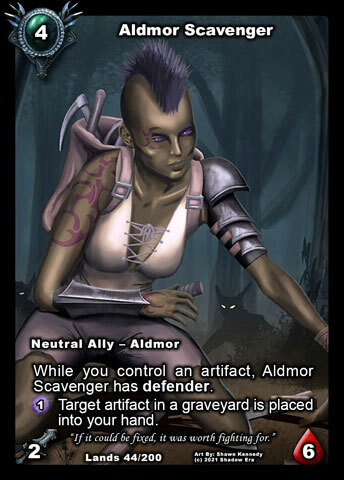 Disciple can be found using the Seek abilities of Aldmor Scout, or the recycle abilities of Gravebone and Rejuvenation Pod. This is due to Disciple of Aldmor’s passive only being active while in play, which is not the case when she is in your deck, hand or graveyard. Notes: Aldmor Chieftan is probably the strongest ally of the entire Aldmor tribe. 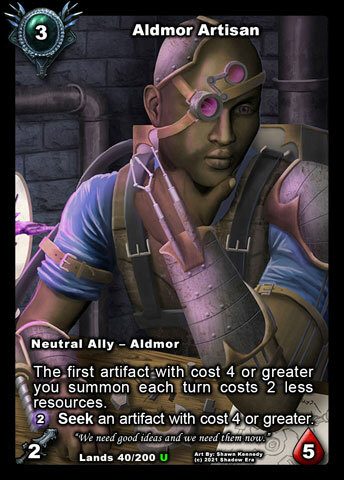 For cost of 4cc you get an Aldon type ally that is stack-able since he is not unique, and he also buffs himself so he is essentially a 3/5. The ability is also very strong as it is similar to Boris, however it cost less, has a wider range of ally cost, can target friendly allies (if you wanted to), Exiles instead of kills (things triggering off being killed do not trigger – Treasured Heirloom). The downside is you cannot target Aldmor allies which makes his activation ability not so great against Aldmor builds (or in them if you are wanting to target friendlies). The flexibility of his activation ability would allow him to be a played in decks outside the alignment generally as an Alternative hero ability type, and probably also in build working with Exile theme. Notes: Aldmor Scavenger is probably my favorite ally of the Aldmor alignment. Once you get any artifact on the board she gains Defender, which goes along very nicely with her high health body. Her activated ability is good too, allow you to be able to target artifacts from any graveyard allowing her to work in discard themed decks as well as alongside item destruction type cards for an indirect steal.She also play well with attack buffs which strengthen Defender. Gaining Defender from any artifact allow her to be a splashable ally in lots of builds. Example. I have seen her used in Twilight build, with Twilight Evangelist (convert Scavenger to Twilight, Renew 4 Resources) and at the end of turn Scavenger can trigger off Eidolon coming back to play. Once readied, then also be able to recycle Eidolon from the graveyard. Notes: Ancient of Aldmor is a very strong ally both in Aldmor and non-Aldmor builds. In a non-Aldmor build Ancient stacks up coming in as either a 3/9 (12 pts) with no Shadow Energy which is just under best combined base stats for 7cc allies, however for each additional SE you have his attack grows and can be a max 13/9 (22 pts) since your hero can store up to 10 SE. In an Aldmor build he most likely is always going to be above the 3/9 stats. Ancient can also be Seeked by Scout, and for every Aldmor ally you own he can come in at a lower cost. What is also interesting is that Ancient is not unique, so you can have multiples on the board at any given time. 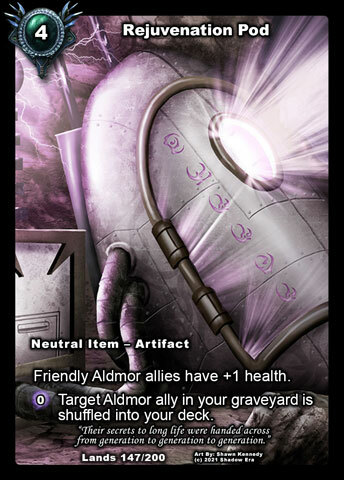 Notes: Aldmor Conduit was the very first Aldmor card released and the only Aldmor artifact that cost under 3cc. This most likely is due to being released before fleshing out the alignment, however the cost is balanced and can be used by both players. This is the only Aldmor Artifact that Aramia can use with her hero ability. Conduit is able to be used by both player so it provides potential bilateral draw option at the cost of stalling out Shadow Energy usage. This can be very effective strategy if your deck is built properly and your opponent decides to draw of conduit. Notes: Aldmor Accelerator is an interesting artifact. 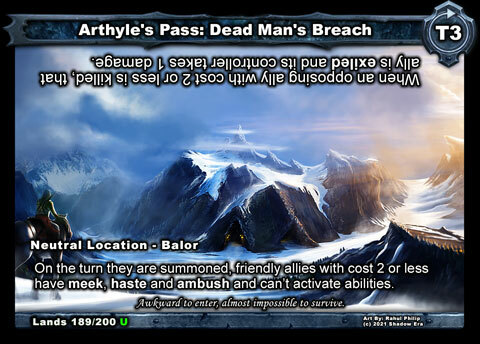 While it does not contain two abilities (passive and active) like other Aldmor 4cc artifacts, it can be used in two different ways. One of the cost for gaining Shadow Energy is to also take 1 damage. This can be used on any hero so you can use to Accelerate your SE, of you can use as “burn” to your opponents. Overall this is similar to Shadow Font, but total SE is acquired over time and with additional cost of health. While Accelerator can be used outside of the alignment, there is lot of synergy within the tribe, specifically with Architect and Scavenger , as well as any SE cost abilities. Notes: Clockwork Soldier is the Eternal Troll of the Aldmor Alignment. 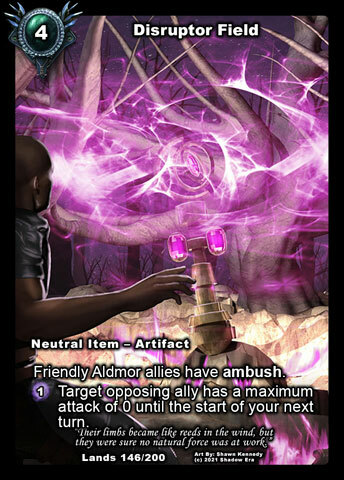 Flavor wise he is very synergistic to the alignment being an artifact that converts to an ally using Shadow Energy. Essentially he can absorb a lot of damage every turn and could be considered Pseudo Healing of 3+ damage for a cost of 1SE as the opponent will be continuously targeting him turn after turn. 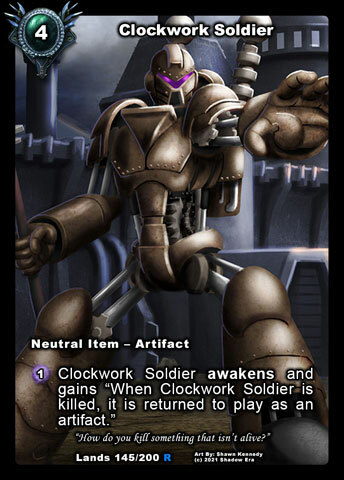 Clockwork soldier as has some synergy with various alignment allies, Aldmor Artisan (Seek from deck), Aldmor Scavenger (Recycle from Graveyard) and Ancient of Aldmor (Reduce Summoning Cost) for various purposes. Clockwork Soldier also has a unique way of forcing the opponent to officially kill him differently than typical allies. The easiest way is to destroy him while in artifact form, exile him, or you can bounce him to deck (Banish), or to hand/top of deck and then force discard, all of which probably going to require some work. Notes: Disruptor Field is an excellent artifact to get out early in the game. 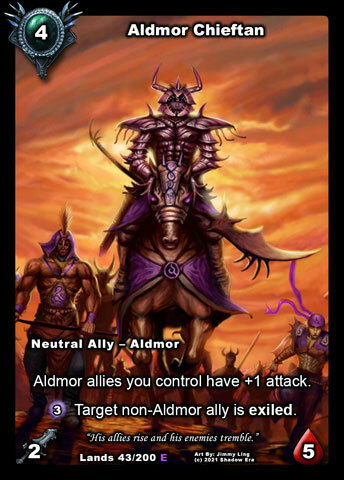 It gives Ambush to Aldmor allies as passive ability, which works well with the low base attack of the Aldmor allies allowing them to chip away at opposing allies. The activation ability is also pretty effect and not too costly, allowing you time to slow the opponents advances and save board or Hero HP while you get set up to extend you later into the game. This is probably my favorite Aldmor Artifact for the versatility it provides to the alignment. Notes: Rejuvenation Pod is probably on the lower end of the spectrum for needing to get into play early and becomes much stronger mid-late game. The passive grant hthe additional health is probably best used in a situation when an ally might die next turn due to damage. The recycling of Aldmor allies from the graveyard is really cool feature which can be combo-ed with Aldmor Scout or be used in general as anti-discard/mill. 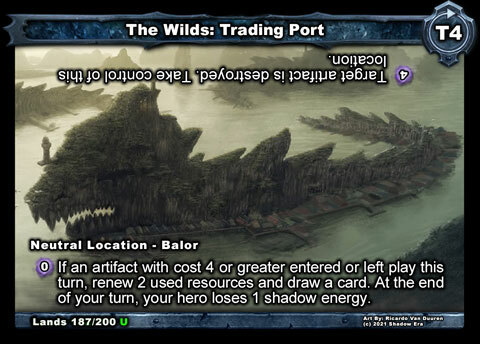 With a 0 cost SE activation I find this is the best Aldmor Artifact trigger source for Darklight Apprentice when trying generate Shadow Energy without spending any. 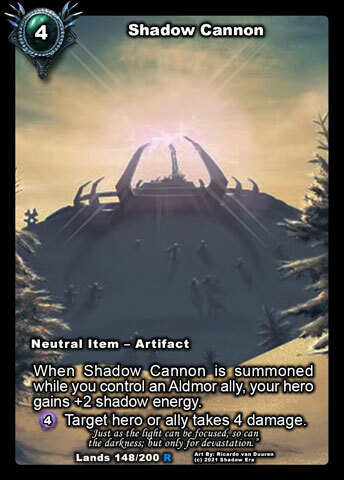 Notes: Shadow Cannon is an excellent card for the Aldmor alignment. It basically becomes a Shadow Font type Shadow Energy ramp that provides an Alternative Hero Ability (Old Eladwen). Being able to target allies and heroes is a excellent feature as you can use this as a potential game finisher depending on needs. 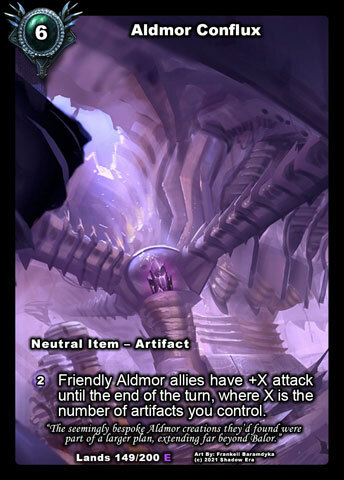 Like all 4+cc artifacts this combos with Aldmor Artisan and can potentially be played on turn 5 as a combo option. While this is going to have the SE ramp when playing with Aldmor allies, this can be played in non-Aldmor decks as a Hero ability replacement option. Example, Ter Adun has an excellent ability, however in some match ups it will never be used, so Shadow Cannon provides a great alternative. 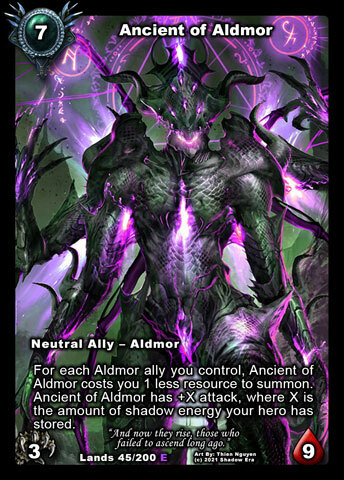 Notes: Aldmor Conflux is the Super Attack Enhancer of the Alignment. This artifact behaves similar to Pride of the Yari but I feel has less value since the setup of playing Artifacts is harder (unique and probably have multiple copies) and the SE Activation cost is also steep. Unlike other Lost Land Aldmor Artifacts, this one does not have a Passive ability. Aside from these negatives, Conflux can really boost the attack power of your allies since it is generally harder to get rid of artifacts than it is to get rid of allies/armors. I think this is a great late game artifact but you will need to be able to survive long enough to setup the other pieces. 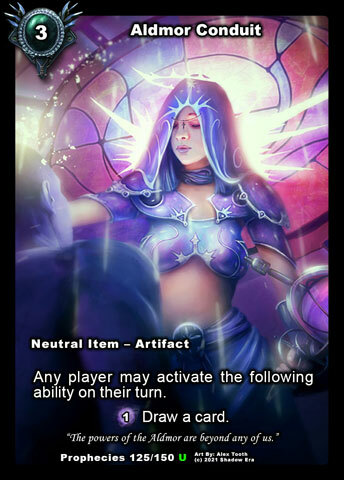 Since there is no passive ability on this artifact so you will most likely play it on the turn you intend to use it. Notes: Curse of the Aldmor is an interesting control tool. 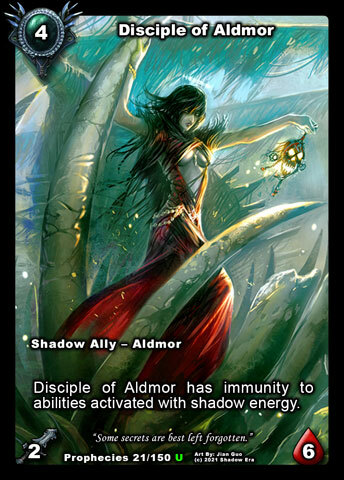 Curse essentially will be used to lock out the growth of opponents Shadow Energy or as Ally removal. Shadow Energy is gained at the beginning of the turn, and Sustain cost SE is paid at the end of the turn so opponent has the potential to use their Shadow Energy during their turn. If at the end of the turn the opponent has no SE then the cost cannot be paid and the ally that curse is attached to will die. Note: if opponent has 2 allies with Curse of the Aldmor attached and can only 1 SE available at the end of the turn, Sustain cost will be paid first by ally closest to the hero, so the next ally(s) will be killed. Learn more about Sustain Costs HERE. 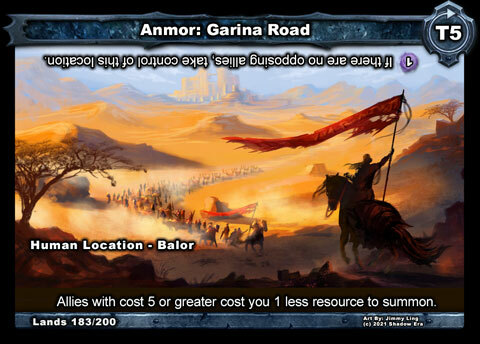 Notes: It is only natural that this location would make sense to use with the Aldmor Alignment. 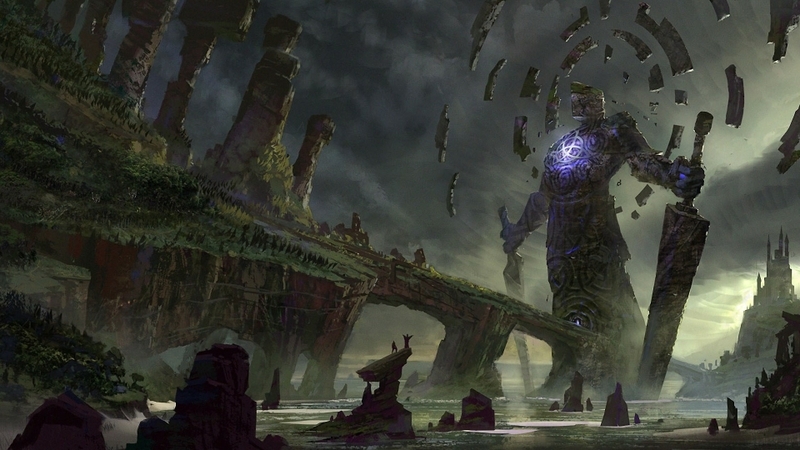 They have a plethora of artifacts with cost of 4 or more and the capabilities of recycling them (Aldmor Scavenger). Generally this is the location I tend to use most when I play with the Aldmor. Notes: Aldmor have quite a number of 1-2 cost allies making this an interesting location. Since all of these low cost allies have activated abilities hasting them onto the boar gives them the greatest chance of survival to utilize their abilities. They all have low base attack values too so gaining Ambush helps them to be able to still attack. They will also combo well with attack boosters to help recover a board and be set to strike on hero on turns following summoning. Tagged aldmor, Aldmor characteristics, alignment, artifacts, control, guide, lost lands, manipulation, shadow energy, Shadow era, shattered fates, tribe. Hey i got decks for 3 archtypes that i think are pretty good, try them out tell me what you think.